There are a few animals that quite meet the eye such as the flamingo which has bright colours such as pink (or orange) feathers, you can easily see them a mile away, but why do they look this way? Flamingos are usually not born with colour they grow into and the reason is very simple. A Shade of Grey: When the flamingos egg hatch and they come out of their shell the colour of their feather shows several shades of grey. It takes quite a long time for the flamingo to take on the colour shade which we mostly connect with and categorize into the family of birds. Colour Change: The colour change in flamingo is triggered by the diet which usually include algae and crustaceans. The brightness of their gravy feathers continues to increase the more they continue on that diet. The food consists of pure chemical which turns into red-orange pigment when broken down after being consumed. The pigment is stored in the body as fat and is used to develop more beautiful feathers. With this happening, the pigment changes the feathers pink. Although this is not permanent as feathers get lost easily on daily basis. The moment the birds stop eating the right diet that is the food that contains the pigment, the colour will vanish. Variations around the world: It’s a very difficult task to find two flamingos that share the same shade of pink. This is as a result of not sharing the same natural colouring. There are differences in the availability of food and the total amount taken by the flamingo which is very vital on how the full feathers of the flamingo will be. 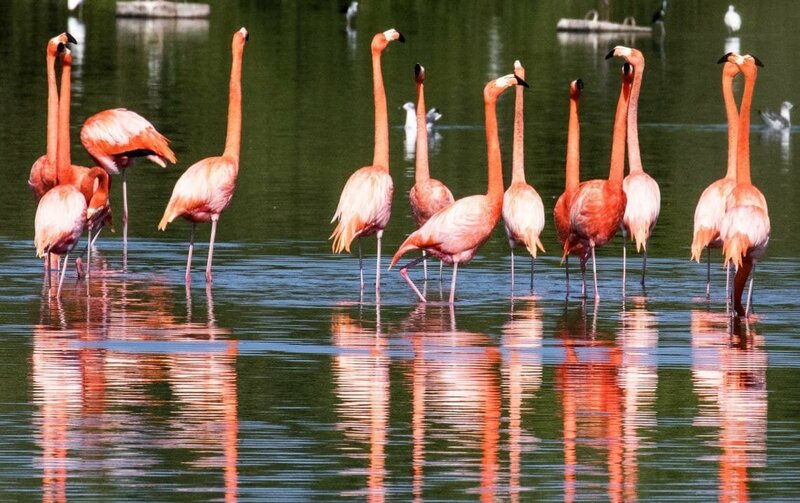 In the Caribbean, flamingos eat much of algae and therefore gives their feathers a more beautiful and attracting colour, be it pink, red or orange. Meanwhile in other parts of the world where it is drier- for example Africa, the flamingos are light toned simply because the source of the food is quite unavailable unlike the Caribbean. 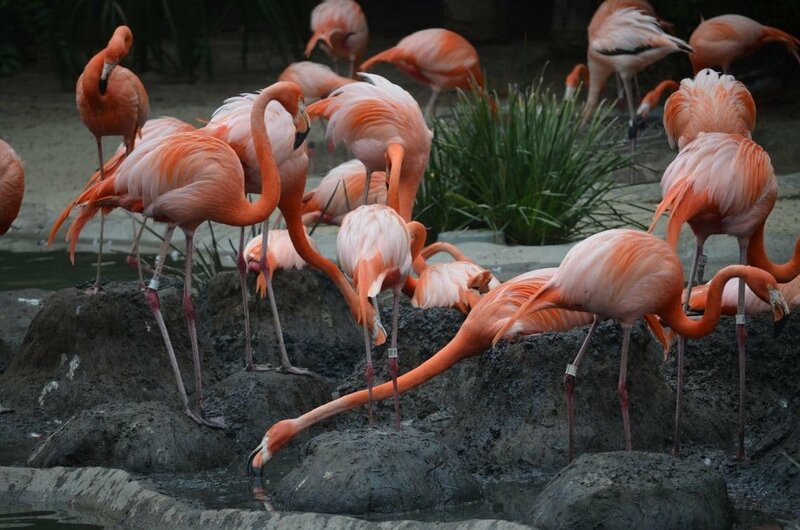 Flamingos which are reserved in the zoos are placed on a specially produced diet which includes crustaceans and additives. The chemicals supply the replacement for the natural ones which they can find in their natural habitat. All what the zoo want is for the flamingo to continually remain bright and stay catchy for all visitors who will pay to see them. Human skin colouring: Beta-carotene is an addictive used for flamingo’s diet and can be found in some foods which human also eat. For example, Carrot has a deposit of this chemical in it, though it is not very effective but it works to its own limit too. For a flamingo to change its colour on a carrot diet, it would take a lot of eating on a systematic basis. I Serial killers don\'t just become killers overnight, they start out by torturing and killing animals as children. More than 71% of women at safe houses gave reports of their partners threatening to kill their pets. II Animals in the fur farm are deprived of natural lifestyle and habitat, including the ability to warm themselves by huddling together or building burros. They are intentionally left outside in winter to deal with the cold so that their fur can thicken up. Sometimes, they die. III Furs farmers do not really care about anything else but how much they do not spend on breeding and killing the animals, and how they can get every single part of the animal\'s fur. IV Females animals kept in fur farms are usually kept longer because they are needed to make more babies that could also be kept for fur, in the same manner as their ancestors. Females are then used for fur when they are unable to reproduce. V There are places where animals are purposefully bred in small restraining cakes for the sake of making fur coats. Many of these animals are only allowed to live for six months before being killed brutally. VI A lot of animals die for the sake of fur coats. On an average, it take either 8 seals, 16 coyotes, 60 mink, 15 beavers, 18 lynx, 20 foxes, 50 muskrats, 20 otters, 50 sables, 40 raccoons, 45 opossums, 35 rabbits or 30 to 200 chinchilla to make a 40-inch fur coat.